When England slipped to 87-7 just after lunch on day three, leading by only 100, the game looked to be done. But then Curran took control. His 63, made by marshalling partnerships with Adil Rashid and Stuart Broad, helped England add another 93 runs. It changed the game and England carried that momentum into their bowling after tea. With India 110-5, still needing 84 to win, the first Test is deliciously poised. The word that comes to mind when you look at Curran is character. There are not many 20-year-olds who come into Test cricket and look as assured as the Surrey man has done. Remember, this is only his second match. Then again, he looked right at home when he made his debut at Headingley against Pakistan earlier in the summer. Here, he played some classy strokes and, when the time came, he changed mode and went up a gear. He is used to having to do that in limited-overs cricket. In that sense, he is typical of the modern game. Ravichandran Ashwin, the off-spinner who has tormented the other left-handers in this England side, was hit straight for six, then four. Curran then swiped Ishant Sharma over extra cover for six to bring up his half-century. How many 20-year-olds, in the history of Test cricket, have taken an opening bowler over extra cover for a maximum to reach their maiden fifty? While all this was going on, the Hollies Stand, noisy and raucous for the first time in the match, was right behind him. Curran brought the crowd to life. This followed his four wickets in the first innings and preceded him removing Ajinkya Rahane late on Friday. At Headingley, I had reservations over his pace. How might he cope when the ball doesn’t swing? Can he add a few extra tricks to his armoury? Here at Edgbaston, he has been dangerous because the ball has swung throughout. Being a left-armer, he has caused problems for an India team full of right-handers, targeting the pads. Because he isn’t quick, he has bowled a full length, getting the ball into dangerous areas. He very rarely bowls loose deliveries and, impressively for such a young man, he seems to have his plans worked out. In the first innings, when Curran was bowling to Hardik Pandya, he pushed the ball across time after time, then pinned him leg before with a big inswinger. Maybe he wouldn’t have played if the likes of Chris Woakes, Mark Wood and Toby Roland-Jones had been fit, but he gives England the variety they have desperately needed for so long. Where could he fit in long-term? Far better judges of batsmen than me are really impressed with him. Could he become a number six that operates as a fourth seamer? There’s every chance. Whatever happens, he now has runs and wickets to his name, so he is up and running in Test cricket. Where he goes from here is up to him. He looks to have the right attitude which, at the highest level, is just as important as having the talent. In that sense, he and his brother Tom remind me a lot of their father Kevin, who played for Northants, Gloucestershire and Zimbabwe. I played against him a lot. Kevin was one of those never-give-up cricketers. He was courageous and calm, but he could also be in-your-face and aggressive. I admired him because he never took a backward step. It was Kevin who was responsible for the nasty scar that I have on my bottom lip. We were playing a game in Harare, nothing more than a friendly, and I walked out to bat with only a few runs needed to win. I wasn’t wearing a helmet. Kevin being the competitor he was, dug in a bouncer that I top-edged into my teeth. There was blood everywhere. I had to be stitched up in a Harare hospital without any anaesthetic. After that, whenever we played against one another, Kevin and I had some ding-dong battles. I wanted my revenge and he knew it. Sadly, Kevin died after collapsing while out running in 2012. He did not get to see Tom make his Test debut during the Ashes or the wonderful performance of Sam here in Birmingham. Sam, though, has helped leave this match in a not dissimilar position as the Ashes Test on this ground in 2005. In that game, Australia ended day three requiring 107 runs, but with only two wickets in hand. We all know what happened next. Here, the contest is more even. India need 84 with five wickets remaining. Crucially, one of those is Virat Kohli. If England get Kohli out, they probably win. If they don’t, the chances are they will lose. James Anderson admitted as much when he spoke to the press at the close. England’s 1,000th Test has fluctuated more than most of the previous 999 and is shaping up to be a match befitting the occasion. It should be a classic finale. 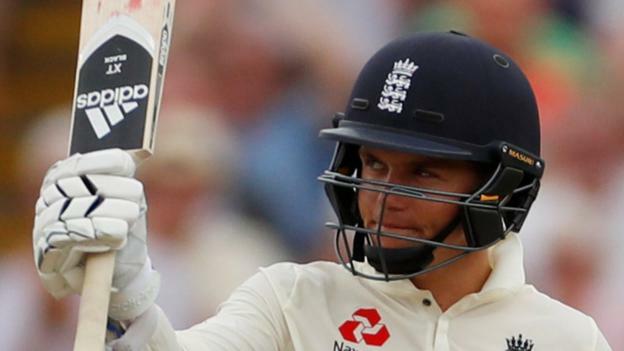 That the first Test between England and India is building up to such an exciting conclusion is thanks to the efforts of Sam Curran. Jonathan Agnew was speaking to BBC Sport’s Stephan Shemilt.